This week, though, I’ve been focusing on the “brick and mortar” business world. Lately, I’ve been making tsuru, otherwise known as folded origami cranes designed to be garden ornaments. Here’s a picture of one in our garden, which has been sitting atop a bamboo pole, which a clematis vine has climbed up. I took the picture on a rainy day, and those white spots are actually rain drops; the crane is solid red. Since she has been there long enough for the clematis vine to grow around her neck, I’m thinking it’s time to give this crane a name. 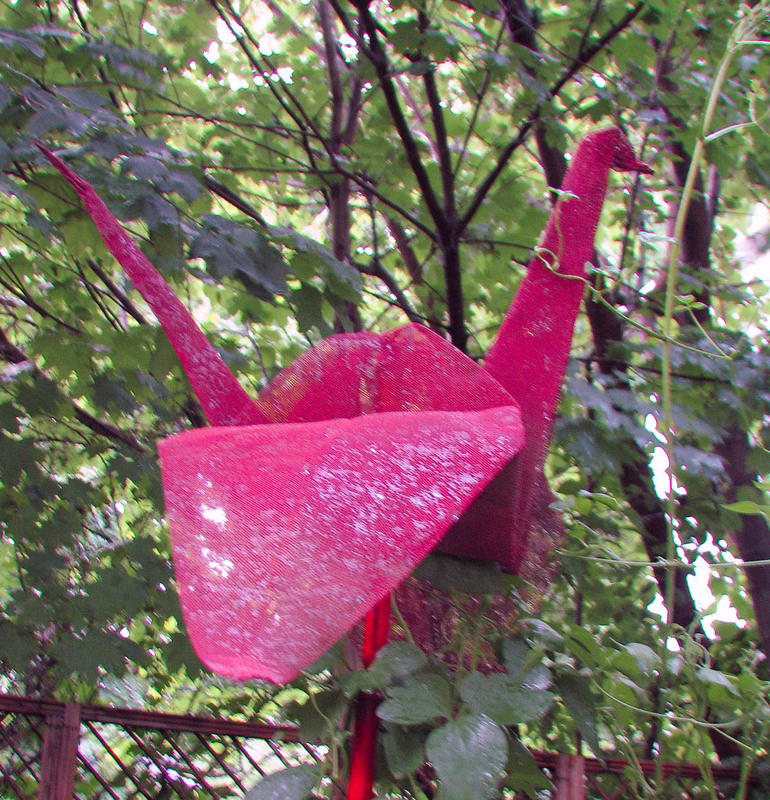 I folded the cranes from 36″ squares of aluminum screening and then painted them with outdoor paint. Folding large sheets of screening is a change from paper, and has its own special challenges, but also special possibilities. Today I started showing my cranes to local garden stores to see if the stores will carry them. I’ll have to see how it goes, though one crane is already on sale, along with other pieces of my work at Artspring, the wonderful craft shop and gallery in downtown Silver Spring associated with the Pyramid Atlantic Center.